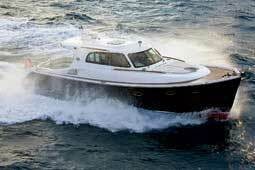 Tug yachts like the Nordic Tugs 42 provide serious cruising ability in an unusual package. It was a 26-foot Nordic Tugs that first kindled my interest in long-range cruising under power, when one pulled into the anchorage where I was living aboard my 27-footer in 1992. 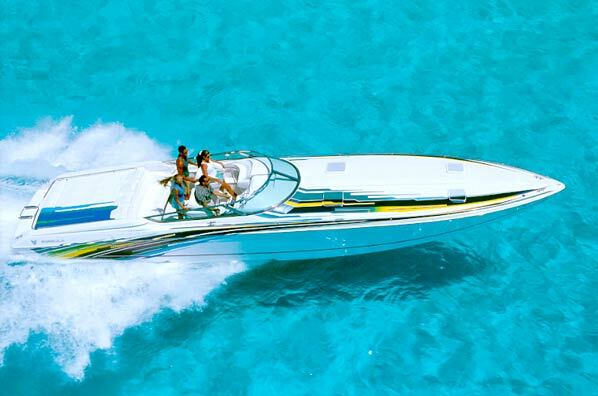 While the whole package seemed almost toy-like at first glance, it was when I went aboard and took a detailed look-see that I realized the boat wasn’t a novelty item—this was a serious cruising package. Today, Nordic Tugs manufactures six models of rugged and capable “tug yachts” ranging from that nifty little 26 footer to a stout 54-foot model with a cruising range of up to 2600 nautical miles. Near the middle of that lineup sits the Nordic Tugs 42, one of the company’s more successful models since its initial launch in 1995; changes that have taken place since its introduction include shifting to a center stairwell in the cabin, and adding a flybirdge option. A Nordic Tug 42 shows off its tuggish looks and semi-displacement trawler qualities at speed. Photo courtesy of Nordic Tugs. While you might think that a tug yacht compromises ruggedness and seaworthiness in favor of those tug looks and lines, you’d be wrong in this case. Assembled in Burlington, WA, the 42’s hull and deck are laid up single-skin style in female tooling using vinylester resin and multi-directional stitched fiberglass cloth, pulled together with a vacuum-infusion process. Stainless steel is used extensively in the hull to reinforce high-stress areas, and the mechanical systems inside the 42’s hull are complete, high-end, and seemingly laid out with every attention to detail. The hull and deck are covered by a transferable 10-year warranty. 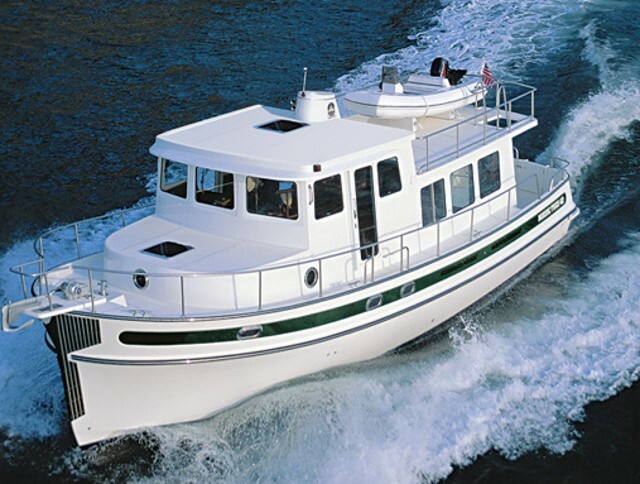 A steep, almost vertical stem with hull lines swept forward to the bow, a rounded forward cabin house, a faux smoke stack, and the steep, vertical arrangement of forward-facing windows on the lofty pilothouse are some of the design elements that make the Nordic Tug 42 look tuggy. But the similarities generally end there. The 42 rides on a full-keeled, semi-displacement hull with integral chines, plenty of freeboard, and a generous amount of forward flare to keep things dry on deck. The whole package looks great, but pay attention to the hull only and you’ll see some curvy, sophisticated lines emerge—rare when you’re trying to be both tug and trawler in one. But don’t just pay attention to the hull, also check out the deck; the Nordic Tugs 42 has plenty of outside relaxing space despite her large interior accommodations, but like many trawler/tug-types, the most suitable lounging areas aren’t up forward. Instead they’re aft on the stern deck, and up above on the cabin house deck (though many will use this area for dinghy or tender storage). The aft cockpit makes a perfect hangout area and has access to the swim platform through an opening transom door, and to the main saloon through a single opening door. 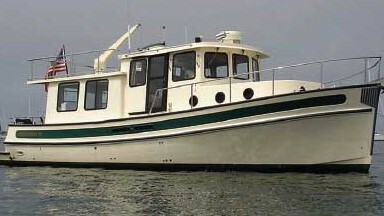 Some might find the side decks somewhat narrow, but the fact that they are not cornered in by a hard bulwark makes going forward or aft around the cabin and pilothouse comfortable and safe, especially because of a sturdy stainless steel railing system that runs almost the entire length of the boat. Inside, the Nordic Tug 42 has an open and spacious main saloon with an L-shaped dinette and U-shaped galley forward, to port. There are tons of sliding windows for light and ventilation, and the interior has a warm, “shippy” look enhanced by the copious use of teak throughout. Access to the pilothouse is via an open, four-step staircase, replete with a sturdy wood handrail and banister. 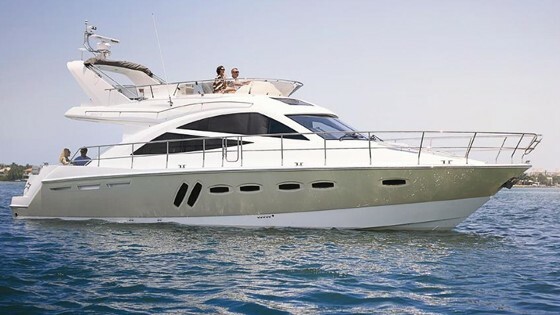 The pilothouse itself is roomy and comfortable (there’s 360-degree visibility), with hefty, opening Diamond Sea Glaze doors to port and starboard, a forward-facing, two-person settee behind the captain’s chair, and a one-person settee to starboard. 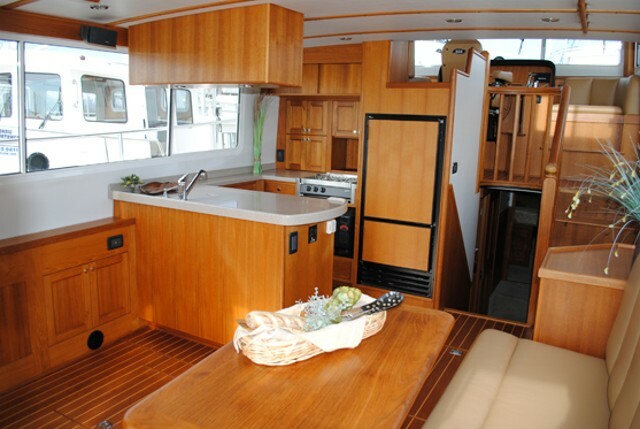 An expansive teak dash has room for plenty of gizmos and gadgets. 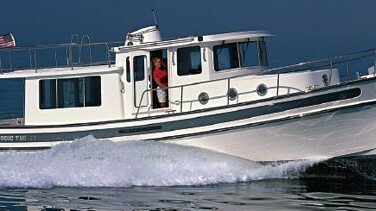 Open and airy define the qualities of a Nordic Tug interior, and the 42 is no different. 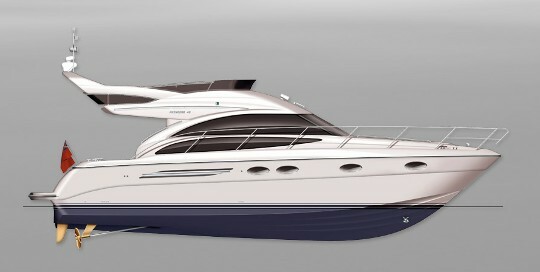 The U-shaped galley and L-shaped dinette in the Nordic Tugs 42 provide comfortable living in the spacious main saloon. Photo courtesy of Nordic Tugs. Down five steps (positioned just to starboard of the U-shaped galley) are the 42’s living accommodations, which are set up for two couples to live privately and separately, just as it should be on a boat of this size. The guest stateroom is located to port with a pullout settee that forms a full-size berth. Across the hallway from starboard is a decent-size nav station with room for a laptop and repeater instruments, if desired. Just forward of the nav station is the guest head, which has a fully enclosed shower, and a sink and head. 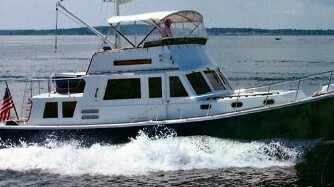 The master stateroom is situated in the bow and features a queen-size island berth, fully enclosed shower with sink and head, generous teak cabinetry and stowage, and adequate daytime lighting and ventilation via a combination of hull-mounted port lights and a deck-mounted, 22-inch opening hatch. A peek into the engine room reveals a single Cummins’ electronic QSC series six-cylinder, 8.3-liter turbo diesel, which in this configuration produces 500 horsepower. The power plant turns a 30-inch, five-blade shaft via a 2.5-inch stainless steel shaft. All running gear is nicely protected with a stainless steel shoe. For those of you worried about maneuvering a single-screw, 42-footer in tight spaces, a Side-Power, 220-pound thruster at the bow is standard, and a stern thruster is available as an option. The Cummins will push the 42 at speeds up to 16 knots, but she is most fuel-efficient at eight to 10 knots, where you’ll get a cruising range of around 1500 to 1700 nautical miles. 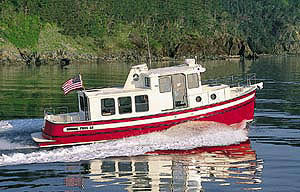 That’s true trawler performance, in a tuggish package. Nordic Tugs prides itself on building capable, efficient power yachts that don’t sacrifice performance or durability for a certain “look,” and the 42 is a success in all of these areas. If extended cruising in a roomy, solid, and seaworthy package with great looks sounds right up your alley, the Nordic Tugs 42 deserves your attention. Other Choices: Another trawler with a unique look is Great Harbor N37; it’s smaller and not exactly tuggish, but certainly has an appearance all its own. The Nordhavn N40 has a more traditional trawler look and significantly longer range at about 2,400 miles, but cruising speed is less at seven knots. See Nordic Tugs 42 listings. For more information, visit Nordic Tugs.